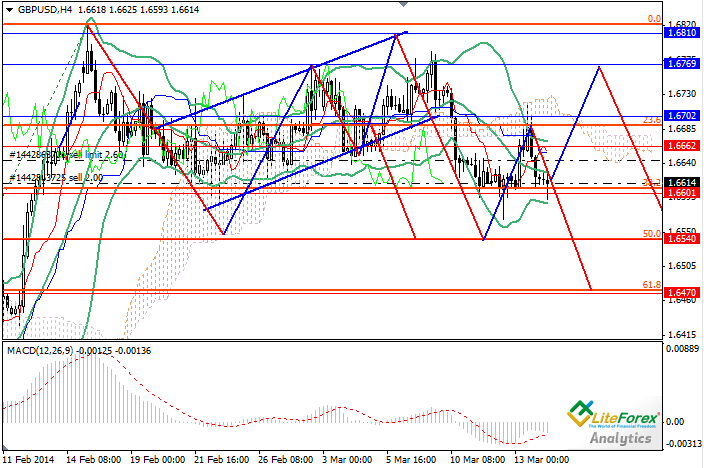 GBP/USD: downtrend or sideways rally? Following sharp decline the pair GBP/USD pushed off from the key support level and went up. Upward movement was supported by the increasing demand for the Pound. The pair has reached the key resistance level of 1.6700 and consolidated near it. Favourable data on US retail sales, labour market and import price index provided additional support to the American dollar and the pair went down. Reserved speech of Mario Draghi and outflow of investments from the risky assets returned the pair to the local lows. At the moment the pair is trading at the level of 1.6600. Important British news is not scheduled for release today except for the publication of trade balance for January.US producer price index for February will also become known today. Demand for the American currency is gradually increasing and the pair is testing support level of 1.6000 for another time. If “bears” manage to break down this level, downtrend is likely to continue. Alternative scenario is also possible: the pair can push off from support level of 1.6000 and go up to 1.6770 (1.6810), and then continue sideways movement in the range of 1.6600 – 1.6810. Support levels: 1.6600, 1.6540 and 1.6470. Resistance levels: 1.6660, 1.6700, 1.673 and, 1.6810. In the current situation it makes sense to place sell orders with profit taking at the level of 1.6470. In view of probability of upward correction it is also advisable to open short positions from the levels of 1.6770 and 1.6810 with profit taking at 1.6600.